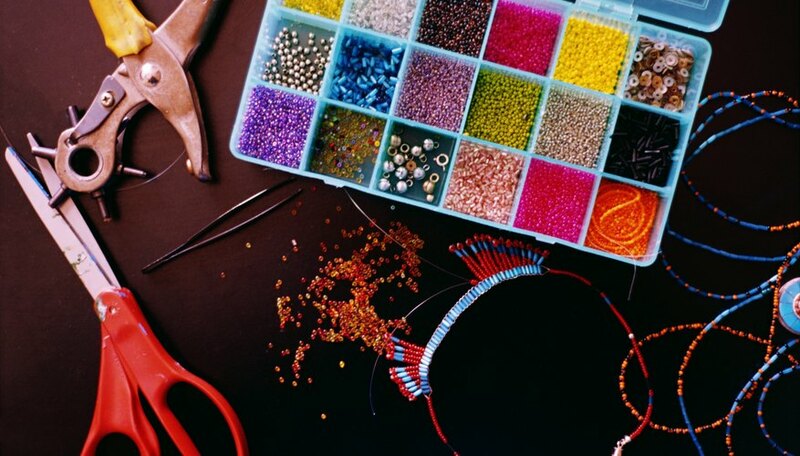 When making jewelry, there are many ways to finish off the necklace with the clasp. One of the simplest techniques is to tie off a cord necklace to the clasp using an overhand knot. Make sure you leave enough cording to tie your knot. After you make the knot, secure the knot with beading glue if you desire. Slide a bead with a large enough hole over the knot if you want to give your necklace a more finished appearance. Push all the beads on the cording so they are snug together. Thread the end of the cording through the loop of one-half of the clasp. Tie the cording into a tight knot approximately ¼-inch away from the loop of the clasp. Tighten the knot and then tie a second knot in the same spot. Apply a dot of beading glue to the double knot and allow it to dry completely before proceeding. Thread the tail of the cording through the three or four beads immediately next to the knot. Push the closest bead over the knot if the bead hole is large enough. Clip the tail of cording where it extends out from the last bead. Repeat Steps 1 through 5 on the other end of the necklace to attach the other half of the clasp.